The Hearst Corporation is one of the nation’s largest diversified media companies with more than 350 magazines and newspapers published around the world, television and cable networks, TV production and distribution entities, radio broadcasting, real estate and more. Esquire, a Hearst Publication, is an award winning lifestyle magazine for men. Founded in 1932, Esquire has expanded from a U.S. only magazine to an international entity with editions for the United Kingdom, Spain, China, Mexico, the Middle East and 15 other countries across Europe, Asia and South America. The Hearst Corporation sought to migrate the existing Esquire iPad application to the Adobe Digital Publishing Suite (DPS). Hearst management recognized that with Adobe DPS their creative staff could easily develop a highly interactive presentation of content amid tight production deadlines all from within Adobe InDesign. In addition, Hearst sought to implement a custom application storefront to better showcase the Esquire brand identity. 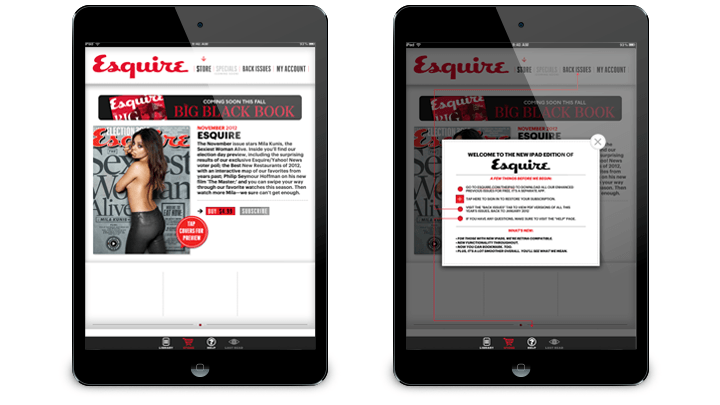 Hearst selected DPCI to help customize the application storefront to promote Esquire’s digital content on the iPad. DPCI provided Adobe DPS consulting services to develop an attractive and intuitive application storefront for subscribers to buy, download and view issues of Esquire magazine and exclusive content available only to digital subscribers. Hearst successfully launched the 2.0 version of the Esquire Magazine Adobe Digital Publishing suite application for the iPad Newsstand in October of 2012. Through the interactive application, customers can download and explore a library of Esquire magazine issues, special issues and other digital products on the iPad.